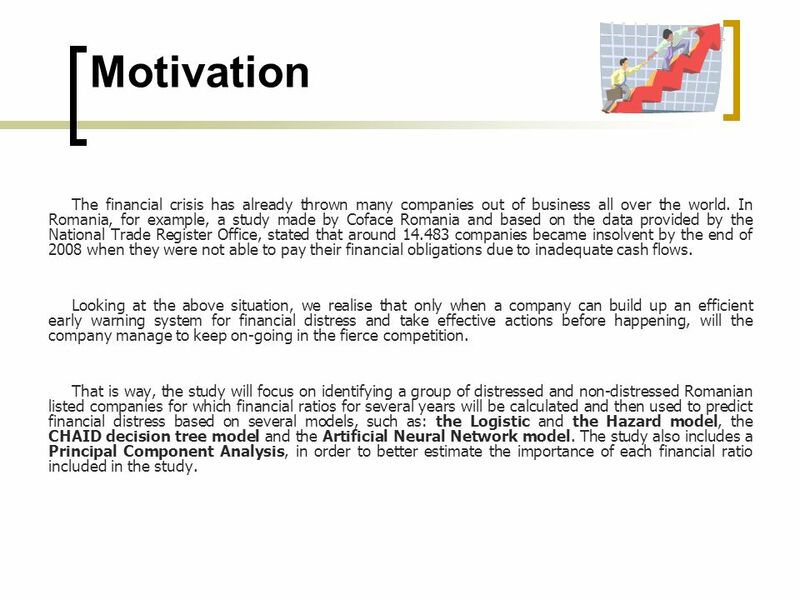 3 Motivation The financial crisis has already thrown many companies out of business all over the world. In Romania, for example, a study made by Coface Romania and based on the data provided by the National Trade Register Office, stated that around companies became insolvent by the end of 2008 when they were not able to pay their financial obligations due to inadequate cash flows. Looking at the above situation, we realise that only when a company can build up an efficient early warning system for financial distress and take effective actions before happening, will the company manage to keep on-going in the fierce competition. 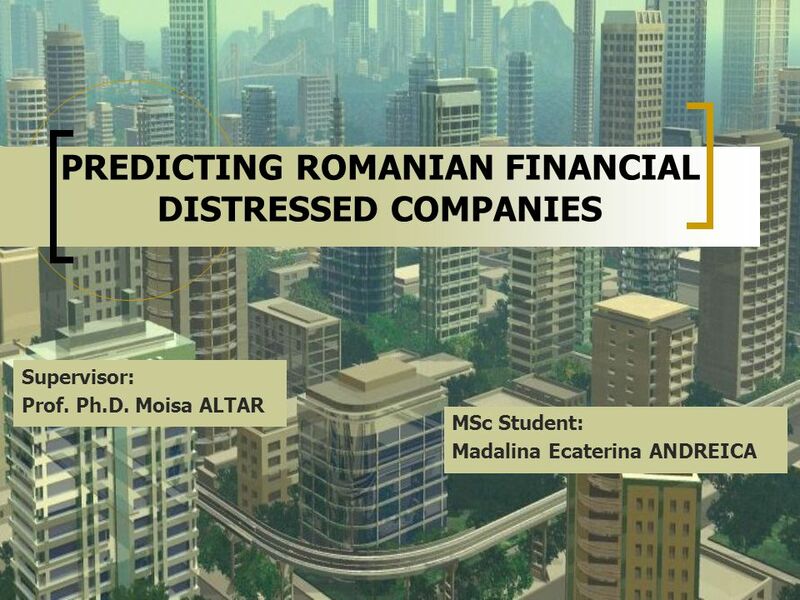 That is way, the study will focus on identifying a group of distressed and non-distressed Romanian listed companies for which financial ratios for several years will be calculated and then used to predict financial distress based on several models, such as: the Logistic and the Hazard model, the CHAID decision tree model and the Artificial Neural Network model. 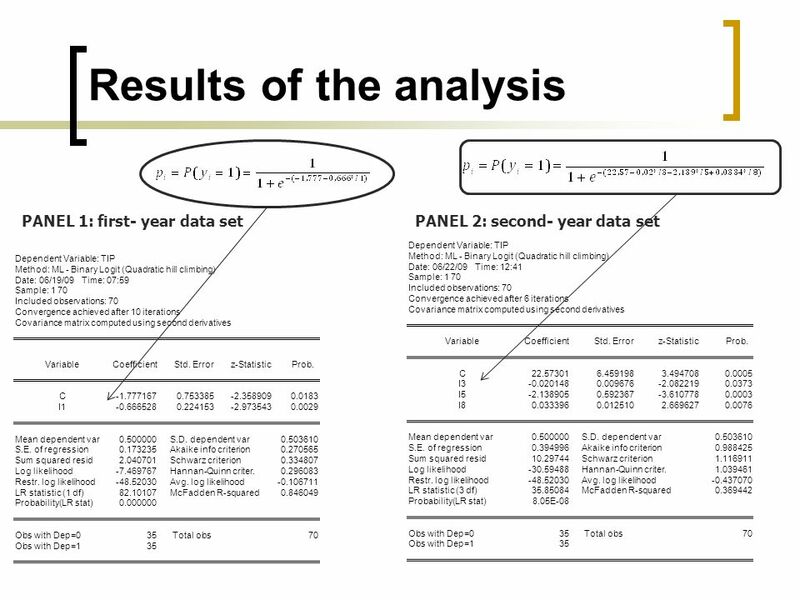 The study also includes a Principal Component Analysis, in order to better estimate the importance of each financial ratio included in the study. 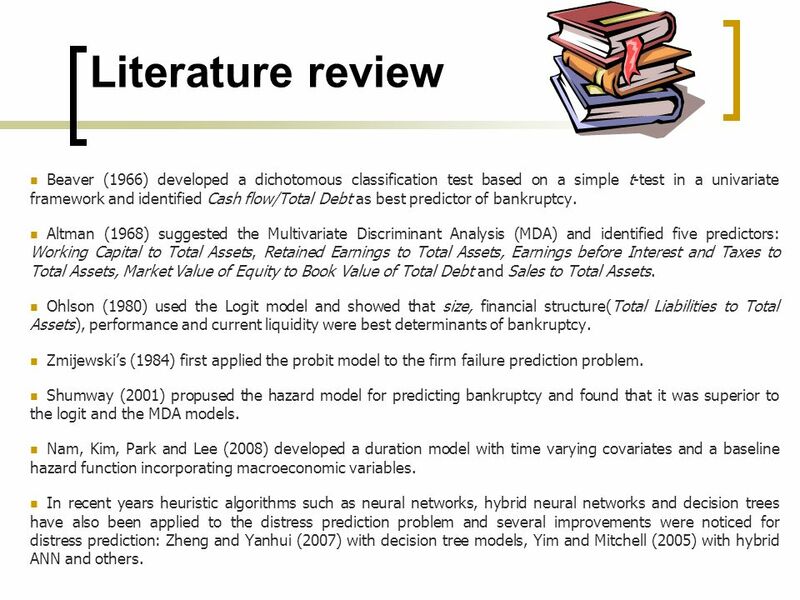 4 Literature review Beaver (1966) developed a dichotomous classification test based on a simple t-test in a univariate framework and identified Cash flow/Total Debt as best predictor of bankruptcy. 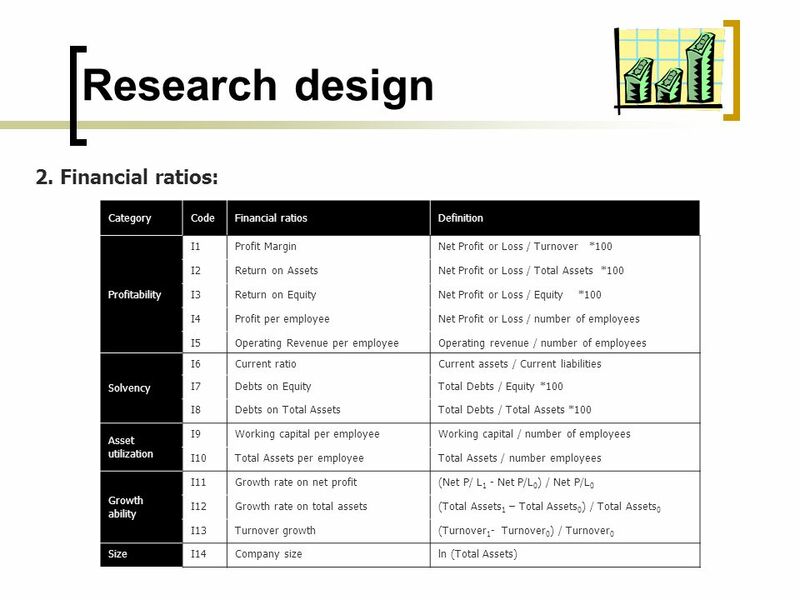 Altman (1968) suggested the Multivariate Discriminant Analysis (MDA) and identified five predictors: Working Capital to Total Assets, Retained Earnings to Total Assets, Earnings before Interest and Taxes to Total Assets, Market Value of Equity to Book Value of Total Debt and Sales to Total Assets. Ohlson (1980) used the Logit model and showed that size, financial structure(Total Liabilities to Total Assets), performance and current liquidity were best determinants of bankruptcy. 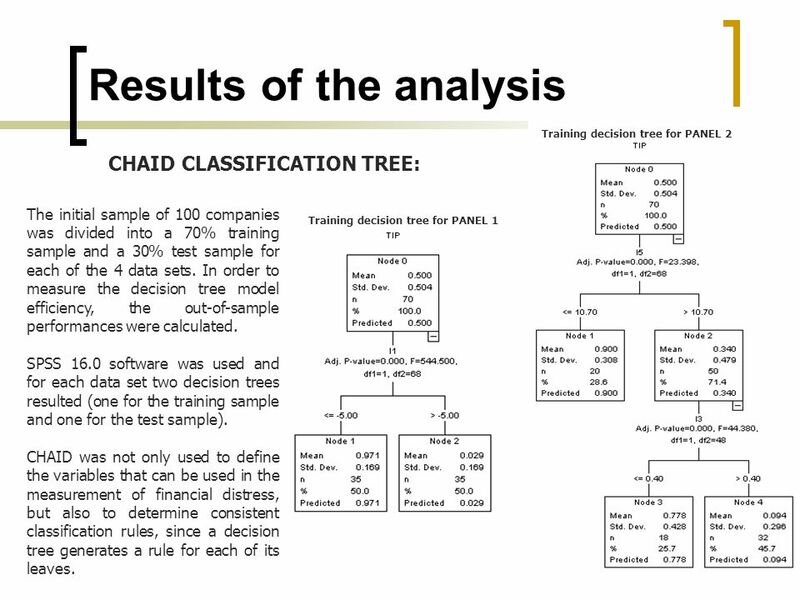 Zmijewski’s (1984) first applied the probit model to the firm failure prediction problem. 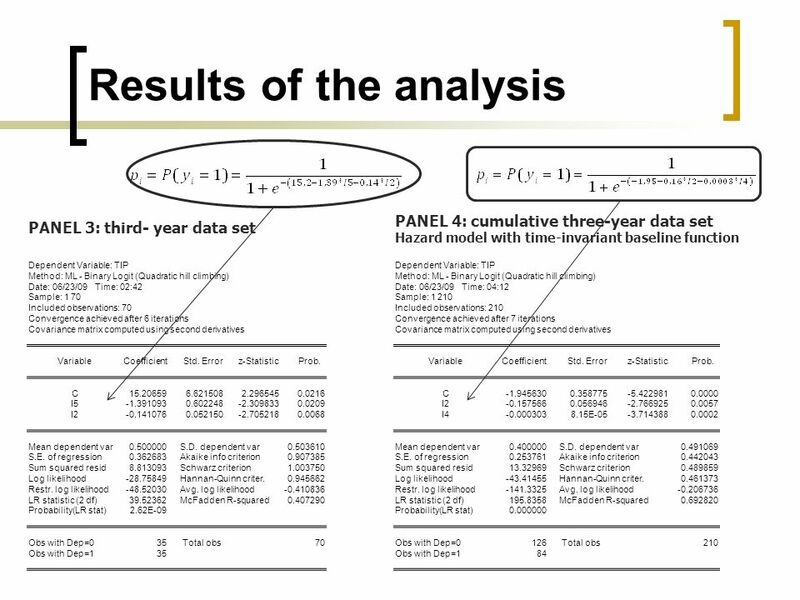 Shumway (2001) propused the hazard model for predicting bankruptcy and found that it was superior to the logit and the MDA models. 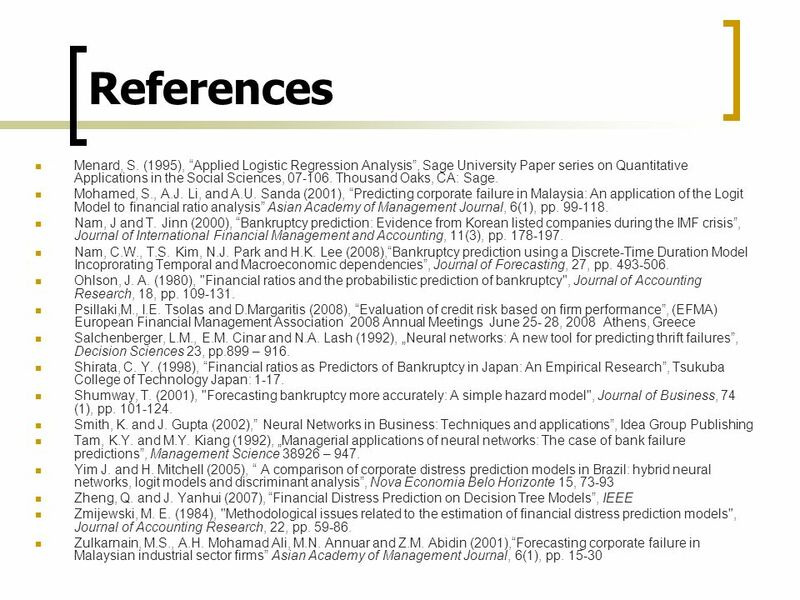 Nam, Kim, Park and Lee (2008) developed a duration model with time varying covariates and a baseline hazard function incorporating macroeconomic variables. 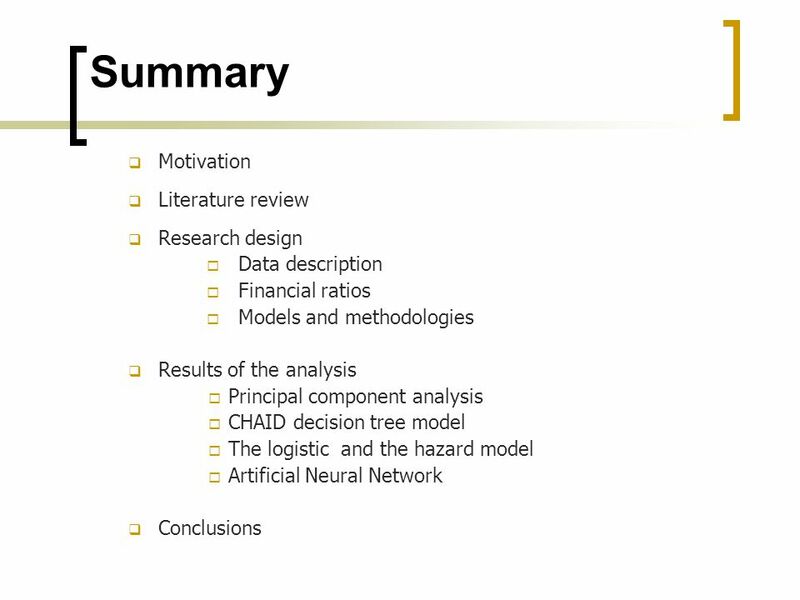 In recent years heuristic algorithms such as neural networks, hybrid neural networks and decision trees have also been applied to the distress prediction problem and several improvements were noticed for distress prediction: Zheng and Yanhui (2007) with decision tree models, Yim and Mitchell (2005) with hybrid ANN and others. For this study, public financial information for the period 2005–2008 was collected from the Bucharest Stock Exchange’s web site. The sample consisted in 100 Romanian listed companies on RASDAQ, equally divided into 50 “distressed” and 50 “non-distressed” companies, that were matched by assets size and activity field. 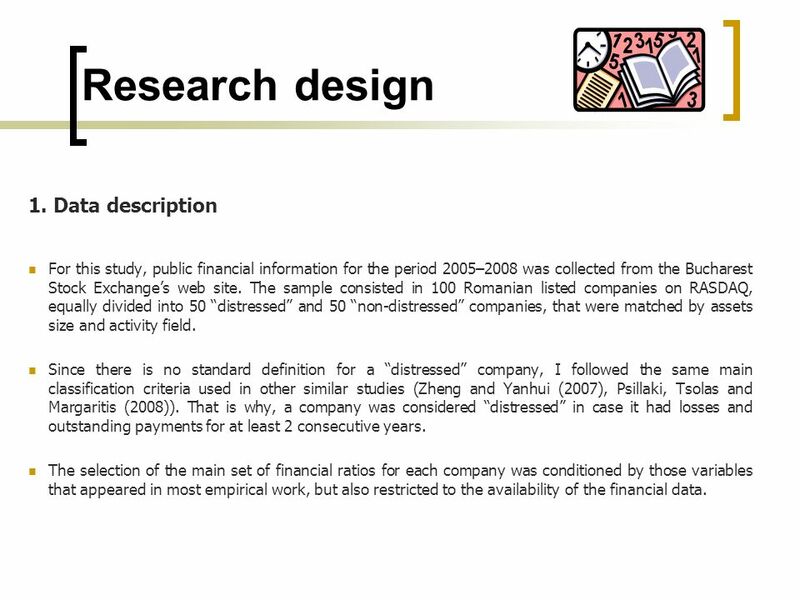 Since there is no standard definition for a “distressed” company, I followed the same main classification criteria used in other similar studies (Zheng and Yanhui (2007), Psillaki, Tsolas and Margaritis (2008)). That is why, a company was considered “distressed” in case it had losses and outstanding payments for at least 2 consecutive years. 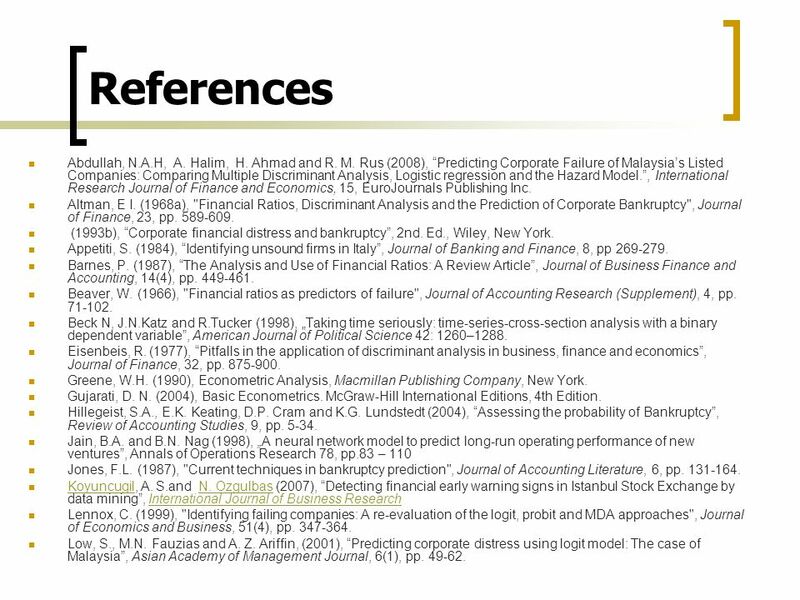 The selection of the main set of financial ratios for each company was conditioned by those variables that appeared in most empirical work, but also restricted to the availability of the financial data. The hazard model is a multi-period logit model, which includes a baseline hazard function, which can be time-invariant or time varying, depending on its specification. 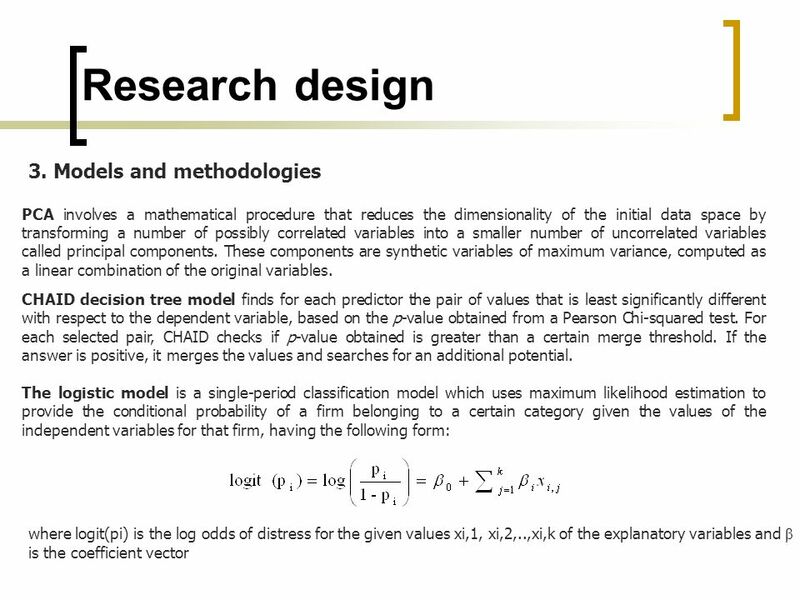 It has the following form: where is the hazard function, xi,t represents the vector of explanatory variables used to forecast distress, is the baseline hazard function and β is the coefficient vector. 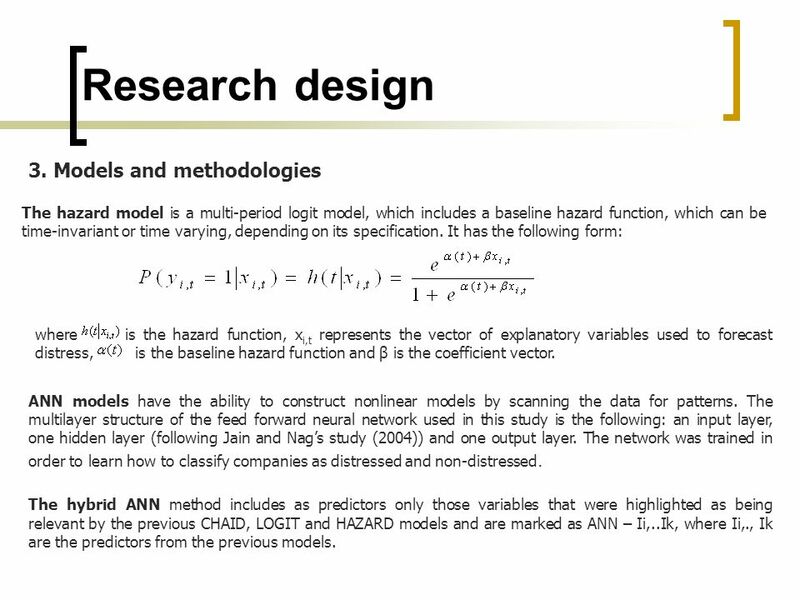 ANN models have the ability to construct nonlinear models by scanning the data for patterns. The multilayer structure of the feed forward neural network used in this study is the following: an input layer, one hidden layer (following Jain and Nag’s study (2004)) and one output layer. 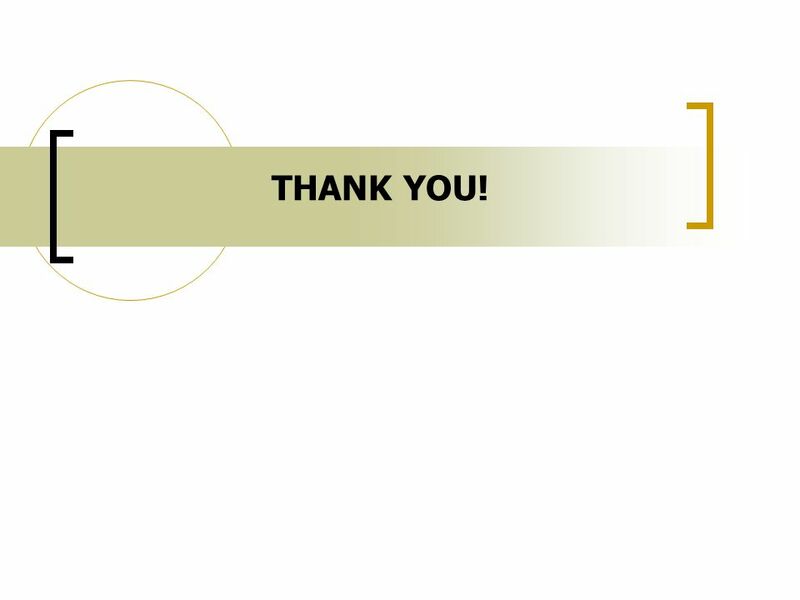 The network was trained in order to learn how to classify companies as distressed and non-distressed. 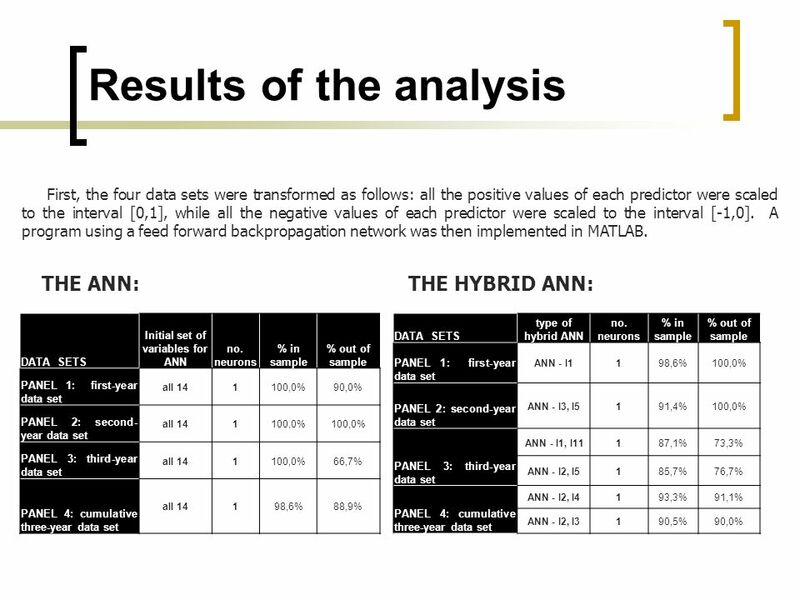 The hybrid ANN method includes as predictors only those variables that were highlighted as being relevant by the previous CHAID, LOGIT and HAZARD models and are marked as ANN – Ii,..Ik, where Ii,., Ik are the predictors from the previous models. 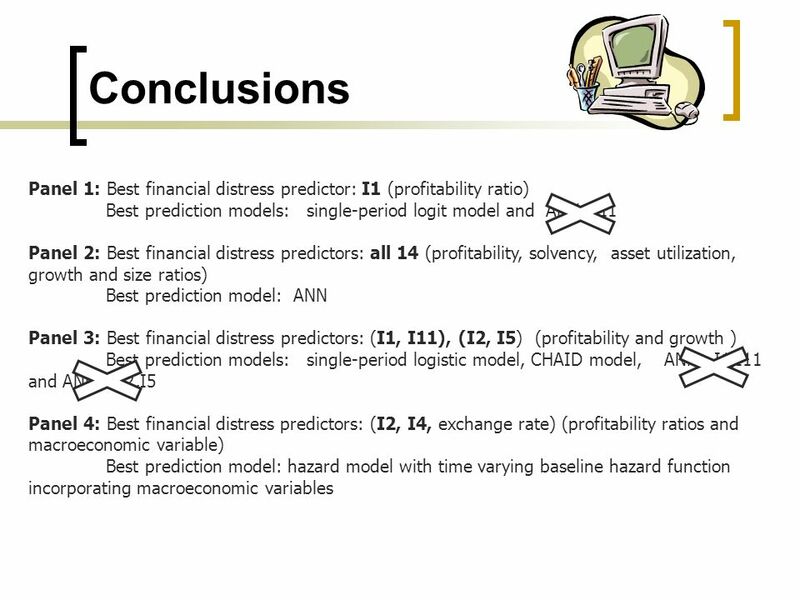 Several distress prediction models were built in search for the model that has best out of sample performances and identifies the financial ratios that are most relevant in distress prediction problem. 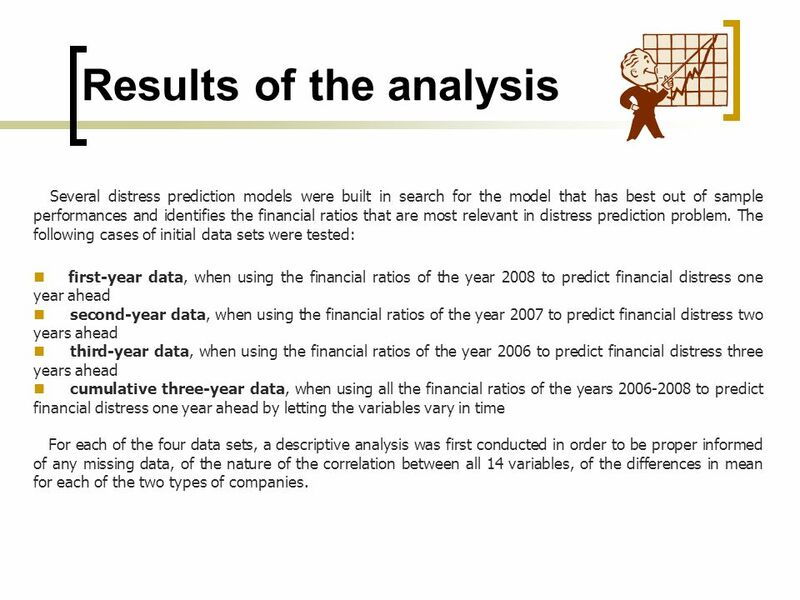 The following cases of initial data sets were tested: first-year data, when using the financial ratios of the year 2008 to predict financial distress one year ahead second-year data, when using the financial ratios of the year 2007 to predict financial distress two years ahead third-year data, when using the financial ratios of the year 2006 to predict financial distress three years ahead cumulative three-year data, when using all the financial ratios of the years to predict financial distress one year ahead by letting the variables vary in time For each of the four data sets, a descriptive analysis was first conducted in order to be proper informed of any missing data, of the nature of the correlation between all 14 variables, of the differences in mean for each of the two types of companies. 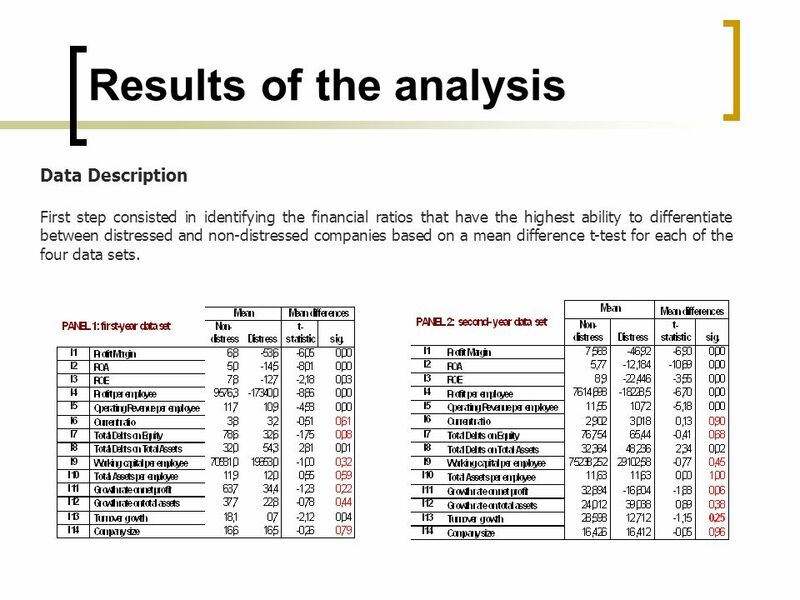 Data Description First step consisted in identifying the financial ratios that have the highest ability to differentiate between distressed and non-distressed companies based on a mean difference t-test for each of the four data sets. 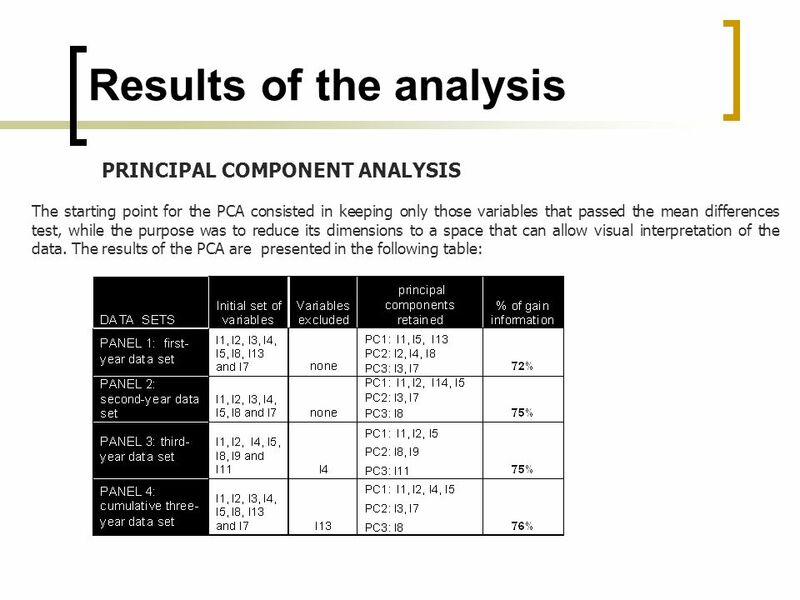 After applying the PCA for each of the 4 data sets the initial space was reduced to a 3-dimensional one, without loosing too much information. 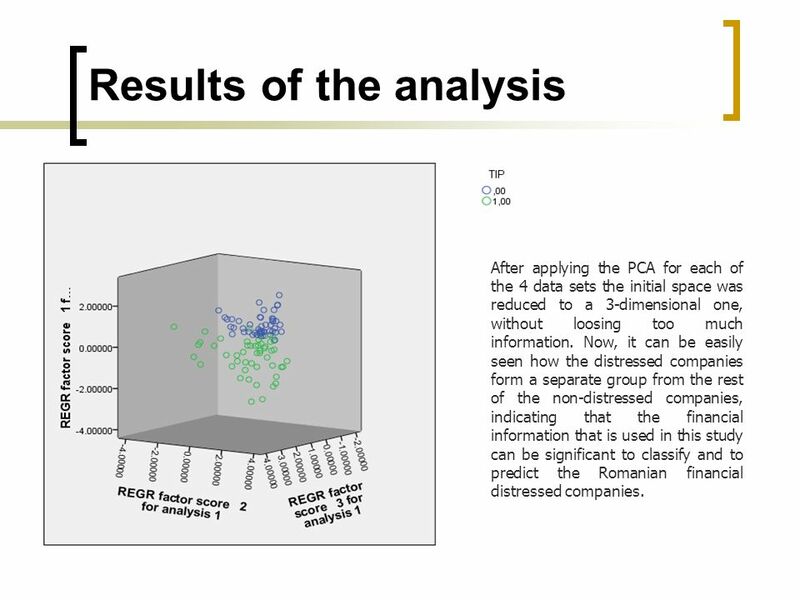 Now, it can be easily seen how the distressed companies form a separate group from the rest of the non-distressed companies, indicating that the financial information that is used in this study can be significant to classify and to predict the Romanian financial distressed companies. 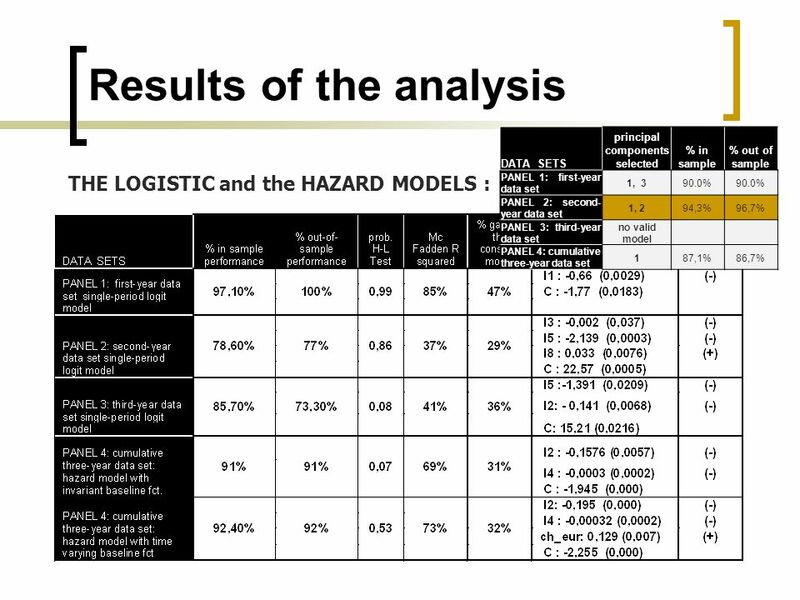 THE LOGISTIC and the HAZARD MODELS: The study was once again divided into 4 parts, by distinctly analyzing each set of data. 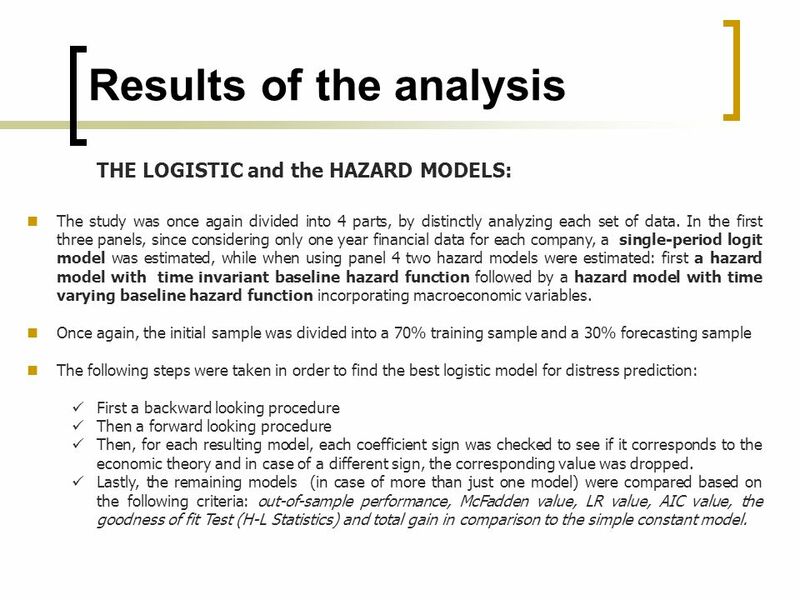 In the first three panels, since considering only one year financial data for each company, a single-period logit model was estimated, while when using panel 4 two hazard models were estimated: first a hazard model with time invariant baseline hazard function followed by a hazard model with time varying baseline hazard function incorporating macroeconomic variables. 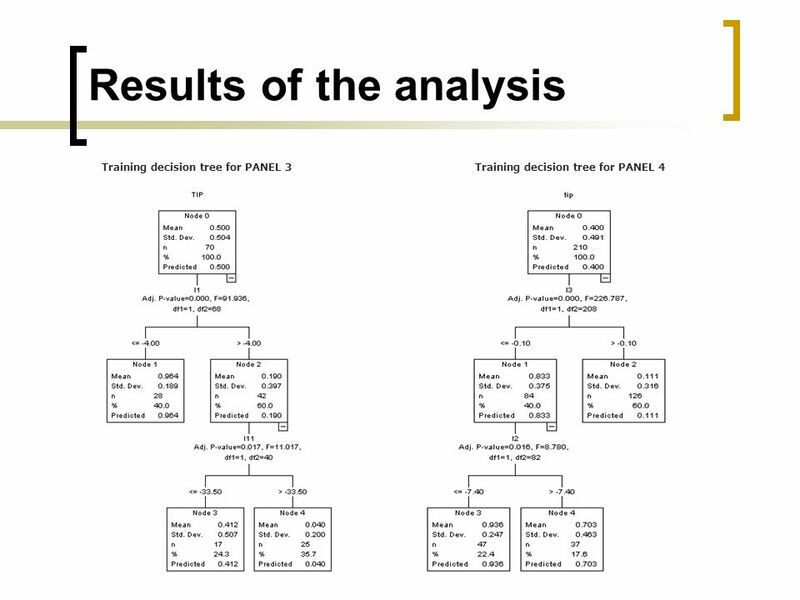 Once again, the initial sample was divided into a 70% training sample and a 30% forecasting sample The following steps were taken in order to find the best logistic model for distress prediction: First a backward looking procedure Then a forward looking procedure Then, for each resulting model, each coefficient sign was checked to see if it corresponds to the economic theory and in case of a different sign, the corresponding value was dropped. 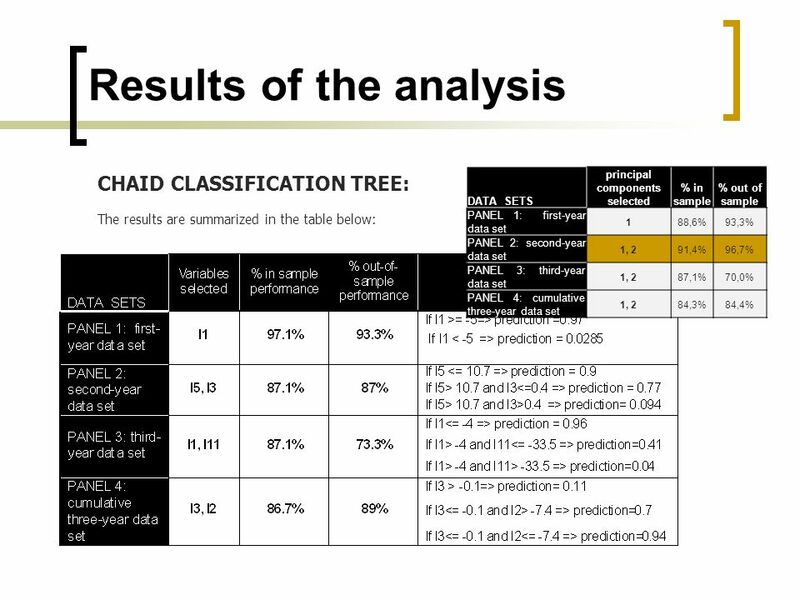 Lastly, the remaining models (in case of more than just one model) were compared based on the following criteria: out-of-sample performance, McFadden value, LR value, AIC value, the goodness of fit Test (H-L Statistics) and total gain in comparison to the simple constant model. Download ppt "PREDICTING ROMANIAN FINANCIAL DISTRESSED COMPANIES"
T3.1 Chapter Outline Chapter 11 Working With Financial Statements Chapter Organization 3.1Cash Flow and Financial Statements: A Closer Look 3.2Standardized. What happens with distress prediction when recession comes Nataša Šarlija Faculty of Economics in Osijek Marina Jeger Faculty of Economics. 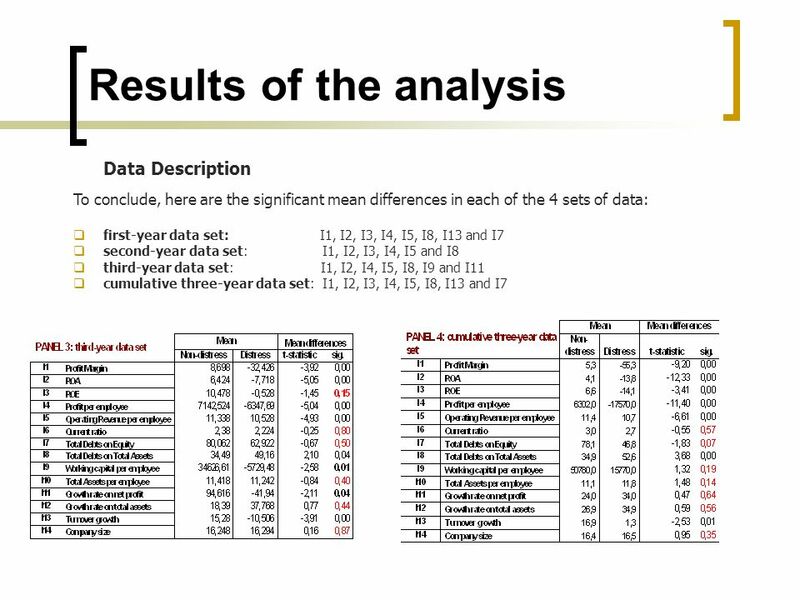 Introduction Data and simula- tion methodology VaR models and estimation results Estimation perfor- mance analysis Conclusions Appendix Doctoral School. 1 Lecture Twelve. 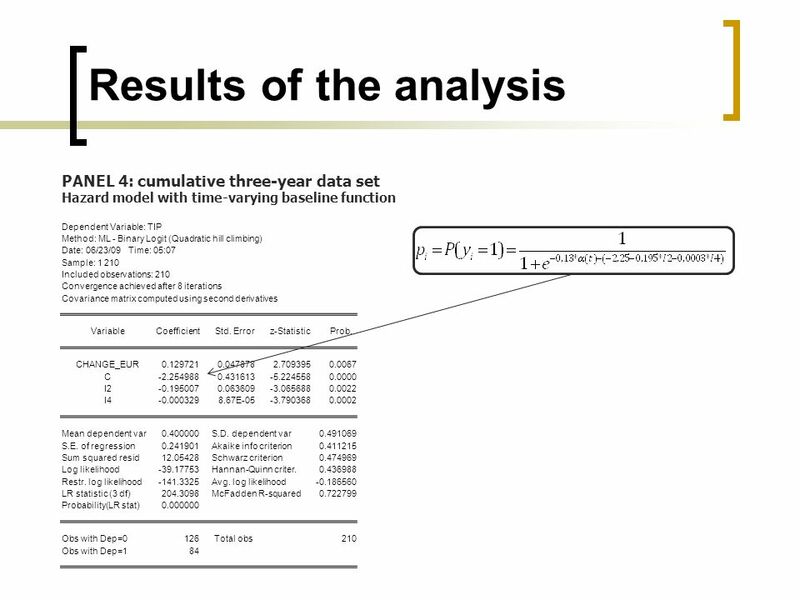 2 Outline Failure Time Analysis Linear Probability Model Poisson Distribution. 1 Finance Basics Rania A. Azmi University of Alexandria, Department of Business Administration. 1 © Copyrright Doug Hillman 2000 Analysis and Interpretation of Financial Statements. Logistic Regression Database Marketing Instructor: N. Kumar.